SIGULDA, Latvia — Dave Greszczyszyn got his World Cup skeleton season off to a 15th place start on Saturday in Sigulda, Latvia. The 2018 Olympian from Brampton, Ont., clocked a two-run time of one minute 44.73 seconds down the 16-corner track to finish as the top Canadian. His time matched Austria's Ronald Auderset for the final spot in the top-15. 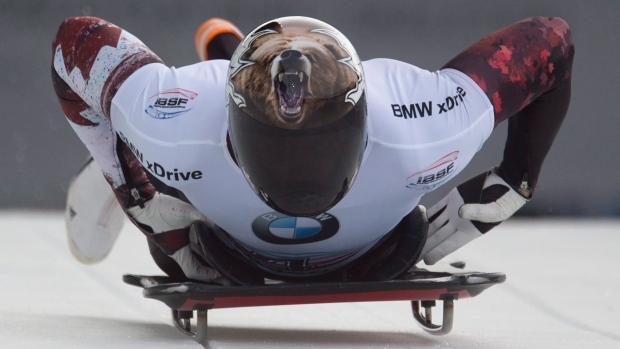 "It was good to finally be competing on the international stage again," said the 39-year-old veteran of the Canadian skeleton squad. "I didn't push as far as I should have in the first run, but when I corrected it in run two, my time was similar, so I need to keep working on my push." Greszczyszyn sat in 14th place after the first descent. He dropped one place in the standings following a 17th place down time in the final heat. "I had a few mistakes and skids in the first run and over controlled things on the second run," said Greszczyszyn. "Too much control, I cut more ice and that slowed me down more than letting it run a bit. It's a very tricky track, probably one of the toughest on tour. I learned a lot this week and would love to come back and apply what I have learned." Russia's Nikita Tregubov rocketed down the Latvian track to a golden time of 1:41.87. Hometown boy, Martins Dukurs, was forced to settle for the silver medal at 1:42.24, while Korea's Sungbin Yun slid to the bronze with a time of 1:42.40. Canada's 25-year-old Kevin Boyer also hit the start block for the season-opener. The Sherwood Park, Alta. resident did not qualify for the second heat with the top-20 after posting the 22nd fastest time in the opening run. "I never really have any expectations in a race — especially here. That was a real tough one today," said Boyer, who competed at the 2018 Olympics. "On a difficult track like here, anything can happen. Today just wasn't my day. I'm obviously bummed about it but trying to take the positives from training and build off those for next week."